Park Ji-sung (Hangul: 박지성; Hanja: 朴智星; Korean pronunciation: [pak̚.t͈ɕi.sʌŋ]; born 25 February 1981) is a South Korean former professional footballer who played as a midfielder, and who currently serves as a club ambassador for Manchester United. Born in Goheung, Jeollanam-do, Park is the most successful Asian player in history, having won 19 trophies in his career. He is the first Asian footballer to have won the UEFA Champions League, to play in a UEFA Champions League final, as well as the first Asian to have won the FIFA Club World Cup. Park was able to play anywhere across the midfield and was noted for his exceptional fitness level, discipline, work ethic and off-the-ball movement. His remarkable endurance levels and pace earned him the nickname "Three-Lungs" Park. Park began his football career in his native South Korea and played for the Myongji University team before moving to Japan to play for Kyoto Purple Sanga. After Park's national team manager Guus Hiddink moved back to the Netherlands to manage PSV Eindhoven, Park followed him to the Dutch side a year later. After PSV reached the semi-finals of the 2004–05 UEFA Champions League, Park's talents were recognised by Manchester United manager Sir Alex Ferguson and he signed Park for a fee of around £4 million in July 2005. In his time at United, Park won the Premier League four times and also won the 2007–08 UEFA Champions League and the 2008 FIFA Club World Cup. He moved to Queens Park Rangers in July 2012 after suffering a reduction in his number of appearances for Manchester United the previous season. However, an injury-interrupted season with QPR, combined with the club's relegation, led to Park rejoining PSV on loan for the 2013–14 season. As a member of the South Korea national team, Park won 100 caps and scored 13 goals. He was a member of the team that finished fourth at the 2002 FIFA World Cup. He also represented his nation at the 2006 FIFA World Cup and was captain at the 2010 FIFA World Cup. Park scored in three consecutive tournaments (the first South Korean and only second Asian player to do so) and is currently South Korea's joint all-time leading goalscorer at the FIFA World Cup finals with three goals, alongside Ahn Jung-hwan and Son Heung-min. Although many sources report that he was born in the South Korean capital, Seoul, Park was actually born in Goheung, Jeollanam-do. He grew up in Suwon, a satellite city 30 kilometres (19 mi) south of Seoul. He began playing football during his fourth year of elementary school. During this time, Park attracted attention as one of the most promising young talents in South Korea and was being scouted by a number of different clubs. He was well known for his excellent work rate, mesmerising dribbling and accurate passes. While in high school (March 1996 – February 1999), he helped his high school team win the national championship in 1998, though he was at that point rejected by a number of professional clubs and universities, due to his small stature, however, his fitness coach, Sam Y. Kim suggested Park should continue to pursue a career in football. He ended up playing for Myongji University after his high school coach strongly recommended him to the university coach. From the winter holiday of his secondary school year, he began to train with his university team as a prospective member. A few weeks later, in January 1999, his university team was given the chance to train with the South Korean Olympics Team. After a splendid performance, he attracted the attention of Huh Jung-moo, the coach of the Olympic Team and South Korean national team (October 1998 – November 2000). Thereafter he became a preliminary member of the Olympics Team, and finally a formal member of its squad. At 18 years old, it was believed that if Park had not been selected for the Under-23 Olympic team, he would have been selected for the under-20 team instead. This selection was so unexpected for Park and others that it was rumoured that Huh selected Park to fulfill a bet after losing to Park's university coach in a game of Go. On 5 April 2000, in a 2000 AFC Asian Cup qualification match against Laos, Park made his debut as a member of the national team, along with Lee Chun-soo. In June 2000, while he was a national team member and a second year student at Myongji University, Kyoto Purple Sanga of Japan offered Park a contract and he took the offer though he was still a relative unknown. Park was the first instance of a relatively unknown Korean player being offered a contract by a Japanese club. In September 2000, at the 2000 Summer Olympics, his Olympics team failed to advance to the knockout stage, and the South Korean national football team replaced head coach Huh Jung-moo with Guus Hiddink. In a practice match, a player arrested our eyes. Despite his injuries, Park's performance was outstanding. Park played only about 20 minutes, however we could see his sense, physical strength, and his potential, so we accepted Park instead of the player we thought. This scout aroused a lot of criticism in Sanga because Park was unknown, to the point that I should resign. In 2001, the club won the J2 League title and were promoted to the J1 League. In 2002, Park led the team to the final of the Emperor's Cup, and in the final on 1 January 2003, he scored the equaliser with a header and assisted on Teruaki Kurobe's winning goal. The team went on to win the match 2–1 to become the Emperor's Cup champions for the first time in Sanga's history. This was Park's last game for Sanga. In January 2003, he left Sanga as Guus Hiddink invited him to play for PSV Eindhoven. After the World Cup, Hiddink was appointed as manager of Dutch club PSV Eindhoven. In 2003, Park and South Korean teammate Lee Young-pyo moved to PSV in order to play under their mentor and former national team coach. While Lee quickly became a fixture in PSV's starting line-up, Park struggled due to injuries. By the end of 2003–04 season, however, Park had begun to adapt to the Netherlands, both on and off the field. In the 2004–05 season, the departure of Arjen Robben to Chelsea afforded Park more starting opportunities and he quickly proved his worth to the team. Along with Johann Vogel, DaMarcus Beasley and Dutchmen Mark van Bommel and Philip Cocu, Park formed the backbone of PSV's midfield play with his pace and passing. Having been a top contributor of goals and assists that season, the highlight of Park's PSV career came when he scored the first goal against Italian team Milan in the UEFA Champions League semi-finals. PSV went on to win the home leg 3–1, but their 2–0 loss during the away leg meant Milan advanced to the final. Nevertheless, thanks to these strong performances, Park was chosen, along with Andriy Shevchenko, Adriano, Samuel Eto'o, and Ronaldinho as one of the nominees for the 2005 UEFA Best Forward award. PSV fans were so enamoured with Park that they wrote a song about him entitled "Song for Park", which was included on the official PSV album PSV Kampioen. In July 2005, Park chose to join Sir Alex Ferguson's Manchester United. Park signed for the Premier League side for £4 million, subject to a medical and work permit. He became the second East Asian player to sign for Manchester United, after Dong Fangzhuo. Park became the first Asian to ever captain Manchester United when he took the armband from Ryan Giggs as he replaced him during a Champions League home group match against Lille on 18 October 2005. Park's first goal for Manchester United came on 20 December 2005, during a 3–1 win over Birmingham City in the League Cup fifth round. On 5 February 2006, Park appeared to have scored his first Premier League goal, against Fulham in United's 4–2 victory at Old Trafford. The Premier League's Dubious Goals Panel, however, later ruled that this was an own goal due to a deflection off the Fulham defender Carlos Bocanegra. On 9 April 2006, Park scored his first official league goal, netting the second of a 2–0 home win over Arsenal. In April 2007, Park was sent to America for surgery on a recurring knee injury, putting an end to his season. Although sidelined by injury for most of the season, he still played in enough matches to become the first South Korean player to win the Premier League. On 1 March 2008, Park scored his first league goal of the 2007–08 season after returning from his long-term injury against Fulham. His lack of appearances had caused much controversy in South Korea, but he proved his worth when he delivered an assist to Wayne Rooney in the Champions League quarter-final match against Roma. On 29 April 2008, Manchester United advanced to the Champions League Final after beating Barcelona. Park, however, was excluded from the squad to face Chelsea in the final despite starting both legs of the semi-final; manager Sir Alex Ferguson later stated that leaving him out was one of the hardest decisions he had had to make throughout his managerial career. Early in the 2008–09 Premier League season, in an away match versus Chelsea, Park scored the only goal for United in a 1–1 draw on 21 September 2008, in a game which he also won the man of the match award. On 13 December 2008, he made his 100th appearance for Manchester United, starting in the match against Tottenham Hotspur at White Hart Lane, the game ended 0–0. Park was included in the 23-man squad for the FIFA Club World Cup held at the end of 2008. He missed the semi-final but played the full 90 minutes in the final which they won 1–0 becoming the first English side to win the competition. On 7 March 2009, Park scored his first FA Cup goal in the 4–0 quarter-final win over Fulham at Craven Cottage, he latched onto a misplaced pass by Zoltán Gera eventually slotting it into the far corner for the fourth and final goal. On 15 April 2009, Manchester United advanced to semi-finals of the Champions League by defeating Porto 3–2 on aggregate. This made Park the only Asian player to be part of Champions League semi-finals on four different occasions. On 2 May 2009, Park verbally agreed to a new four-year £50,000-a-week deal at Manchester United, stating, "I have no reason to move. I play at the best club in the world." Following this announcement, Park scored his second league goal of the season – and third overall – in a 2–0 away win against Middlesbrough. On 5 May 2009, Park scored his first Champions League goal for Manchester United in the second leg of the semi-final against Arsenal at the Emirates. He pounced on a slip by Kieran Gibbs and placed the ball over Manuel Almunia in the eighth minute, with the game ending 3–1 (4–1 on aggregate), advancing United to the Champions League final for the second year running. Park became the first Asian player in history to play in a Champions League final. On 14 September 2009, Park signed a three-year contract extension with United, keeping him at the club until 2012. Ferguson said during the summer that he was always confident a deal would be done with Park, whose wages are estimated to be about £75,000 a week. On 31 January 2010, Park scored his first goal of the 2009–10 season, hitting United's third in a 3–1 win against Arsenal. His last goal also came against Arsenal at the Emirates in the same scoreline, coming in the 2008–09 Champions League, this was also the first time United had beaten Arsenal at the Emirates in the Premier League. On 10 March 2010, Park scored his first European goal of the season which was also his first for United in Europe at Old Trafford, hitting the third in a 4–0 win over Milan. This was also his second goal against Milan in the Champions League. On 21 March 2010, Park scored a crucial winner in the derby against Liverpool, turning in Darren Fletcher's right-wing cross with a diving header. On 4 May 2010, Park committed himself to United by openly claiming he would like to spend the rest of career with them, saying, "There is no reason to move to any other team." On 9 May 2010, Park netted on the final day of the season, scoring a close-range diving header against Stoke City to wrap up a 4–0 win. Park returned to the United team for the first time following the World Cup as he started against a League of Ireland XI in their final pre-season game on 4 August 2010. He marked this game with the first ever goal scored at the newly built Aviva Stadium, he then scored a second later on as United ended the game 7–1 winners. On 22 September 2010, Park netted his first goal of the 2010–11 season as he scored United's fourth of a 5–2 away win against Scunthorpe United in the 3rd round of the League Cup. He then netted in the next round of the League Cup, scoring United's second goal in a 3–2 home win over Wolverhampton Wanderers on 26 October 2010. Park scored his first two league goals of the season in a 2–1 home win over Wolves on 6 November, the second a late winner in the 93rd minute. On 27 November, Park scored United's second goal in a 7–1 home victory over Blackburn Rovers. Park's performance's during November 2010 helped him gain the Player of the Month award from the club's website. Park was then voted as United Player of the Month for December 2010, grabbing the award for the second month in a row. On 13 December, Park netted the only goal of the match against Arsenal, a looping header, his fourth goal in seven starts against them. Park jetted off to captain South Korea in the 2011 Asian Cup and missed seven games for United after the turn of the year. Upon his return from the subsequent tournament, he was ruled out for one month due to an hamstring injury which occurred during training. He returned to action for the first time since Boxing Day on 2 April, playing 64 minutes of a 4–2 away win over West Ham United. Park scored his first goal since the turn of the year when he scored the winning goal in the Champions League quarter-final second leg tie against Chelsea, ending in a 2–1 win (3–1 on aggregate). He also scored a goal and set up the second goal for Anderson in the last match of the season against Blackpool. Park played in another Champions League final, against Barcelona in 2011, which United lost 3–1. During the United States tour, Park scored in a 4–1 win against the New England Revolution and in a 7–0 win against Seattle Sounders FC. In the last USA tour game, which Manchester United won 4–0, Park was named the man of the match after scoring a goal on the stroke of half-time. On 28 August 2011, Park scored the sixth goal in an 8–2 home win against Arsenal, shortly after coming on as a second-half substitute. Park made his first start of the season in the Premier League in a 2–0 home win against Norwich City. Late on in the game he was involved in a neat one-two with Danny Welbeck in the creation of United's second goal of the day, which Welbeck finished. On 26 December 2011, Park scored an early goal in United's 5–0 home win against Wigan Athletic with a neat, side-foot finish from Patrice Evra's cutback. He also won the penalty that wrapped up the win which Dimitar Berbatov scored to complete his hat-trick. In an FA Cup fourth round clash against Liverpool, Park scored an equalising goal with a low finish from a Rafael cross to make it 1–1; however, United went on to lose the tie. On 5 February 2012, Park made his 200th appearance for Manchester United by coming on as a substitute in the 86th minute against Chelsea. He became the 92nd player in the history of the club to reach the milestone. On 23 February 2012, Park captained Manchester United for the first time from the beginning of a match in a 2–1 home defeat to Ajax in the UEFA Europa League. Although the match ended in a defeat, United still advanced to the round of 16 with a 3–2 aggregate score. 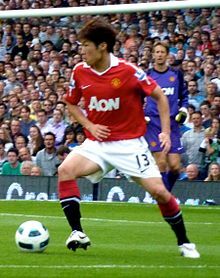 On 30 April 2012, Park played in the Manchester derby, in a game that was widely perceived as crucial to Manchester United's title defence. Manchester United lost the game 1–0 and Manchester City went on to win the Premier League title. Having received less first-team football in his last season at Manchester United, Park moved to Queens Park Rangers for an undisclosed fee on 9 July 2012, signing a two-year contract with the Hoops. He made his debut in a 5–0 defeat at home to Swansea City on the opening day of the season on 18 August 2012. Park's first season with QPR was largely unsuccessful. Despite initially being made club captain, a combination of injuries and lack of form meant that Park was unable to have the kind of impact that was expected after his signing from Manchester United. Park finished the season with only 20 Premier League appearances and no goals, as QPR were relegated from the top flight of English football. With QPR no longer in the top flight, Park rejoined PSV on loan for the 2013–14 season. The deal was completed on 8 August 2013, but Park's work permit application delayed his first game back for the club. He scored his first goal against Heracles Almelo at 86 minutes to tie the game on 24 August, his second match with PSV after his return. On 14 May 2014, shortly after the conclusion of the season, Park announced his retirement, citing issues with his knee. Reflecting on his career, he said, "I'm leaving with no regrets, I enjoyed playing football. I have achieved more than I thought I would. I'm truly grateful for all the support I have received and I will live the rest of my life thinking how I can pay it back." In 2016, Park attended De Montfort University to read sports management with a view to coaching in the K League. He began course studies for The FIFA Master - International Master in Management, Law and Humanities of Sport, which he graduated from in July 2017. On 5 October 2014, it was announced that Park was to take up a role as a global ambassador for Manchester United. He has also participated in the Asian Dream Cup annual charity event with a team entitled "Park Ji-Sung and Friends". Fellow professionals who have played with him at the event include fellow South Korean internationals Ahn Jung-hwan and Lee Chung-yong, North Korean international Jong Tae-se and United teammate and former England captain Rio Ferdinand, while celebrities who have also done so include current cast members and alumni of the popular SBS variety show Running Man, including actor Song Joong-ki, singer Kim Jong-kook and rapper Gary. As a result, Park's involvement in the 2012 edition marked his first appearance on the show over three episodes. He is the founder of the charitable foundation, JS Foundation, set up in 2011, which develop and launch charity programs that will support football infrastructure and also the necessaries of life. Park began his international career for South Korea as a 19-year-old defensive midfielder and made his first appearance selection during 2000 Sydney Olympics U-23 regional qualifier, selected by the manager Huh Jung-moo. When Guus Hiddink became the head coach of South Korea, Park's position was shifted to that of a winger; since then, he has become a versatile player able to play in a variety of positions: central, right and left midfield, as well as wing-forward. Park scored a memorable goal during the 2002 FIFA World Cup. During the group stages South Korea had won their first game against Poland and drew against the United States. In order to advance, they had to manage a draw at the least against favoured Portugal side, which included Luís Figo and Rui Costa. The game was 0–0 until the 70th minute following two red cards against Portugal, when Park scored the match winner, controlling the ball with his chest and beating Sérgio Conceição before volleying it through the legs of Portugal goalkeeper Vítor Baía and into the net with his left foot. His goal eliminated Portugal and advanced South Korea into the knockout stages of the tournament for the first time. South Korea eventually made it to the semi-finals with victories over Italy and Spain, becoming the first Asian team to do so in the history of the FIFA World Cup. Park scored the second penalty in the quarter-final shoot-out against Spain, which South Korea won 5–3. Park's success in the World Cup continued into the 2006 tournament. He scored the equalising goal in the second Group G match against eventual finalists France and was voted man of the match. On 11 October 2008, Park captained South Korea for the first time in a friendly against Uzbekistan. Korea won 3–0. He was the skipper for the remainder of the qualification campaign for the 2010 World Cup and was top scorer with five goals. One of his goals was against Iran in Seoul, beating two defenders then scored with his left foot. South Korea advanced to the finals without a single defeat. On 12 June 2010, Park netted in his third consecutive World Cup, scoring the second goal in South Korea's 2–0 win over Greece in their first group match, and celebrated the goal with a double windmill (swinging both arms round and round). He became the first Asian to score in three consecutive World Cup finals and became Asia's joint all-time leading scorer in the World Cup with three goals, alongside compatriots Ahn Jung-hwan and Son Heung-Min, as well as Sami Al-Jaber of Saudi Arabia. Park's father, Park Sung-jong, said his son has planned to end his national team career after the 2011 Asian Cup tournament in Qatar. Park travelled to the tournament on 26 December 2010 as squad captain. Park made his 100th international appearance in the semi-final match against Japan on 25 January 2011. However, it would not end in victory as they lost 3–0 during the penalty shoot-out following 2–2 after extra time. South Korea coach Cho Kwang-rae confirmed on 28 January that Park had retired from international duty as he was left out of their 3–2 third place play-off victory over Uzbekistan. Park was nominated as the tournament's MVP alongside Mark Schwarzer, Keisuke Honda and Server Djeparov. The award was eventually won by Japan midfielder Honda. On 31 January, Park confirmed his retirement from international football to make way for younger players with "enormous potential". Park received much acclaim at Manchester United for his work rate and energy which saw him deployed all over the midfield, including in the middle of the pitch and on both wings, where he operates as a "defensive winger". He was also known as something of a "big game player", as he was often used by Sir Alex Ferguson in big league games or European games where there was an extra emphasis on defensive work. In his 2013 autobiography, I Think, Therefore I Play, Italian midfielder Andrea Pirlo wrote that Park, who was deployed to man-mark him in matches for both PSV and Manchester United in the Champions League, was the one player that he could not get the better of. Pirlo wrote of Park, "The midfielder must have been the first nuclear-powered South Korean in history, in the sense that he rushed about the pitch at the speed of an electron." Park largely kept his personal life out of the spotlight and surprised the media by announcing his upcoming wedding to former television reporter Kim Min-ji at his retirement press conference. They married on 27 July 2014 in South Korea. Their daughter was born in London in November 2015. ^ "Premier League clubs submit squad lists" (PDF). Premier League. 2 February 2012. p. 23. Archived from the original (PDF) on 27 February 2012. Retrieved 2 February 2012. ^ "Ji-Sung Park". Barry Hugman's Footballers. Retrieved 26 May 2018. ^ "Player Profile: Ji-Sung Park". Premier League. Archived from the original on 6 September 2012. ^ "Asia's most decorated footballer Park Ji-sung calls it a day". ^ "Manchester United Legends squad profiles - Official Manchester United Website". www.manutd.com. ^ "United's Park first Asian to play Champions League final". Reuters. 27 May 2009. Retrieved 26 December 2009. ^ "Ji-Sung Park – Quote, Unquote". ManUtd.com. Manchester United. Archived from the original on 25 July 2011. Retrieved 22 April 2011. ^ "Manchester United's Park Has the Endurance to Persevere". New York Times. 25 May 2009. ^ "PARK Ji Sung". KFA.or.kr. Korea Football Association. 31 January 2011. Archived from the original on 14 September 2012. Retrieved 31 January 2011. ^ "Ji-Sung Park". Soccerbase. Centurycomm. Retrieved 18 July 2012. ^ Ducker, James (26 May 2009). "Park Ji Sung is a Seoul star out of the ordinary". The Times. London. Archived from the original on 26 May 2011. ^ "Park interview" (in Korean). Joins.com. 9 May 2008. Retrieved 9 May 2008. ^ Park, 2006, p. 213; "I failed to have good condition after the 6 weeks of injury, I felt teammates started not to trust me anymore." ^ "PSV first teams by year". Retrieved 8 May 2007. ^ "PSV 3–1 AC Milan (agg: 3–3)". BBC Sport. British Broadcasting Corporation. 4 May 2005. Retrieved 5 May 2007. ^ "Best Forward 2005". UEFA. 1 July 2005. Archived from the original on 11 July 2012. Retrieved 22 April 2011. ^ "Park Ji-Sung pulls the strings for South Korea". CBA. 25 November 2009. Retrieved 31 July 2010. ^ "Man Utd set to complete Park deal". BBC Sport. British Broadcasting Corporation. 22 June 2005. Retrieved 20 March 2009. ^ "Park passes Old Trafford medical". BBC Sport. British Broadcasting Corporation. 24 June 2005. Retrieved 20 March 2009. ^ "Park cleared for Red Devils move". BBC Sport. British Broadcasting Corporation. 5 July 2005. Retrieved 5 July 2005. ^ "Park Ji-Sung: Top Asian Football Player". Worldrec.info. World Rec. 22 January 2010. Retrieved 8 November 2010. ^ Adamson, Mike (18 October 2005). "Manchester United 0–0 Lille". The Guardian. London. Retrieved 18 October 2005. ^ "Birmingham v Man Utd". Retrieved 21 July 2007. ^ "Manchester United 4–2 Fulham". Football.co.uk match reports. Retrieved 10 April 2006. ^ "Man Utd 2–0 Arsenal". BBC Sport. British Broadcasting Corporation. 9 April 2006. Retrieved 9 April 2006. ^ "Park: Cartilage op confirmed". ManUtd.com. Manchester United. Retrieved 27 April 2007. ^ "Park not on the list against Bolton" (in Korean). Sports Seoul. 20 March 2008. Archived from the original on 10 February 2009. Retrieved 4 May 2008. ^ Jackson, Jamie (1 March 2009). "Park Ji-sung: the true player's player". The Observer. London. Retrieved 1 March 2011. ^ McNulty, Phil (21 September 2008). "Chelsea 1–1 Man Utd". BBC Sport. British Broadcasting Corporation. Retrieved 26 September 2008. ^ Hughes, Ian (13 December 2008). "Tottenham 0–0 Man Utd". BBC Sport. British Broadcasting Corporation. Retrieved 13 December 2008. ^ McNulty, Phil (7 April 2009). "Fulham 0–4 Man Utd". BBC Sport. British Broadcasting Corporation. Retrieved 7 April 2009. ^ Thomas, Phil (2 May 2009). "Park lands new Man Utd deal". The Sun. London: News Group Newspapers. Retrieved 2 May 2009. ^ Chowdhury, Saj (2 May 2009). "Middlesbrough 0–2 Man Utd". BBC Sport. British Broadcasting Corporation. Retrieved 2 May 2009. ^ McNulty, Phil (5 May 2009). "Arsenal 1–3 Man Utd (agg 1–4)". BBC Sport. British Broadcasting Corporation. Retrieved 5 May 2009. ^ "Manchester United v Barcelona: Park Ji-Sung is first Asian in Champions League final". The Telegraph. London. 27 May 2009. Retrieved 27 May 2009. ^ "Park agrees new Man Utd contract". BBC Sport. British Broadcasting Corporation. 14 September 2009. Retrieved 14 September 2009. ^ "Arsenal 1–3 Man Utd". BBC Sport. British Broadcasting Corporation. 31 January 2010. Retrieved 31 January 2010. ^ "Man Utd 4–0 AC Milan". BBC Sport. British Broadcasting Corporation. 10 March 2010. Retrieved 10 March 2010. ^ McNulty, Phil (21 March 2010). "Man Utd 2–1 Liverpool". BBC Sport. British Broadcasting Corporation. Retrieved 21 March 2010. ^ Chong, Edwin (4 May 2010). "Park committed to United". Sky Sports. Retrieved 4 May 2010. ^ "Airtricity League 1–7 Man Utd". BBC Sport. British Broadcasting Corporation. 4 August 2010. Retrieved 4 August 2010. ^ Ashenden, Mark (22 September 2010). "Scunthorpe 2–5 Man Utd". BBC Sport. British Broadcasting Corporation. Retrieved 22 September 2010. ^ Stevenson, Jonathan (26 October 2010). "Man Utd 3–2 Wolves". BBC Sport. British Broadcasting Corporation. Retrieved 26 October 2010. ^ Chowdury, Saj (6 November 2010). "Man Utd 2–1 Wolves". BBC Sport. British Broadcasting Corporation. Retrieved 6 November 2010. ^ Chowdury, Saj (27 November 2010). "Man United 7–1 Blackburn". BBC Sport. British Broadcasting Corporation. Retrieved 27 November 2010. ^ Hibbs, Ben (10 December 2010). "Park is November's star". ManUtd.com. Manchester United. Retrieved 10 December 2010. ^ Coppack, Nick (6 January 2011). "Park tops poll". ManUtd.com. Manchester United. Retrieved 6 January 2011. ^ Chowdury, Saj (13 December 2010). "Man United 1–0 Arsenal". BBC Sport. British Broadcasting Corporation. Retrieved 13 December 2010. ^ Wilson, Jeremy (13 December 2010). "Manchester United v Arsenal: player ratings". The Daily Telegraph. London. Retrieved 13 December 2010. ^ a b Tuck, James (24 December 2010). "Park aims to leave on a high". ManUtd.com. Manchester United. Retrieved 24 December 2010. ^ Sanghera, Mandeep (2 April 2011). "West Ham 2–4 Man Utd". BBC Sport. British Broadcasting Corporation. Retrieved 2 April 2011. ^ McNulty, Phil (12 April 2011). "Man Utd 2–1 Chelsea". BBC Sport. British Broadcasting Corporation. Retrieved 12 April 2011. ^ "Exclusive: R's Swoop For Park". qpr.co.uk. 9 July 2012. Archived from the original on 12 July 2012. Retrieved 9 July 2012. ^ "QPR 0–5 Swansea". BBC Sport. British Broadcasting Corporation. 18 August 2012. Retrieved 18 August 2012. ^ "Ji-Sung Park keert terug bij PSV" [Ji-Sung Park returns to PSV]. psv.nl. PSV. 8 August 2013. Archived from the original on 3 July 2014. Retrieved 8 August 2013. ^ "Heracles Almelo - PSV". PSV. Archived from the original on 25 August 2013. Retrieved 25 August 2013. ^ "Park Ji-Sung: Former Man Utd & South Korea player retires". BBC Sport. 14 May 2014. Retrieved 15 May 2014. ^ "Old Trafford star Park chooses DMU to learn about the business of football". De Montfort University. 21 September 2016. Retrieved 14 October 2016. ^ 오, 유진 (18 March 2016). "박지성, FIFA 마스터코스 최종합격 통보 받아". ^ "Ji-sung Park returns to Old Trafford". ManUtd.com. Manchester United. 2 October 2014. Retrieved 28 December 2014. ^ "Park Ji-sung Sets up Charity Foundation". Retrieved 12 February 2018. ^ "JS Foundation". www.js-foundation.org. Retrieved 12 February 2018. ^ "South Korea vs Poland". Archived from the original on 19 April 2008. Retrieved 11 May 2008. ^ "Portugal 0–1 South Korea". Retrieved 11 May 2008. ^ a b "France 1–1 South Korea". BBC Sport match reports. 18 June 2006. Retrieved 11 May 2008. ^ Soneji, Pranav (12 June 2010). "South Korea 2–0 Greece". BBC Sport. British Broadcasting Corporation. Retrieved 8 August 2013. ^ "World Cup 2010: goal celebrations – in pictures". The Telegraph. Retrieved 19 October 2018. ^ "Park aims at Asia's best scorer". Retrieved 16 June 2010. ^ "AFC Asian Cup to be Park's swansong". The-AFC.com. Asian Football Confederation. Retrieved 17 December 2011. ^ Tuck, James. "Park's landmark cap". ManUtd.com. Manchester United. Retrieved 25 January 2011. ^ Whan-woo, Yi. "S. Korea loses to Japan in penalty shootout". The Korea Times. Retrieved 25 January 2011. ^ "South Korean Park Ji-sung quits international football". BBC Sport. British Broadcasting Corporation. 31 January 2011. Retrieved 31 January 2011. ^ a b "Four-midable quartet shortlisted for MVP". The-AFC.com. Asian Football Confederation. Retrieved 28 January 2011. ^ "Hero Honda named MVP". The-AFC.com. Asian Football Confederation. Retrieved 30 January 2011. ^ "Park retires from international duty". The-AFC.com. Asian Football Confederation. Retrieved 31 January 2011. ^ Wilson, Jonathan (4 June 2009). "The Question: Are defensive forwards the future?". The Guardian. London. ^ Cox, Michael. "Tactics: Manchester United use wingers to great effect". ITV. Archived from the original on 16 April 2011. ^ Orr, James (14 May 2014). "Park Ji-Sung retires: Why Andrea Pirlo will be pleased he no longer has to play against the 'nuclear-powered South Korean'". The Independent. London. ^ MUTV (9 December 2014). Park Life (Documentary). United Kingdom: Manchester United. ^ "Patrice Evra attends Ji-Sung Park's wedding in South Korea". Manchester Evening News. 28 July 2014. ^ "Park Ji Sung and Kim Min Ji Welcome Baby Daughter into the World". Soompi. 19 November 2015. ^ Endlar, Andrew. "Park Ji-Sung". StretfordEnd.co.uk. Retrieved 26 September 2010. ^ "Park Ji-sung's official record of the national team". ^ "Ji-Sung Park – Century of International Appearances". Rec.Sport.Soccer Statistics Foundation. 14 March 2011. Retrieved 14 March 2011. ^ "Park, Ji-Sung". National Football Teams. Benjamin Strack-Zimmerman. Retrieved 25 January 2011. ^ "Park Ji-Sung: Overview". Premier League. Retrieved 17 April 2018. ^ Gandini, Luca (2 June 2016). "European Champions' Club Cup/UEFA Champions League winning squads". Rec.Sport.Soccer Statistics Foundation. Retrieved 13 May 2018. ^ "Match #47: Portugal : Korea Republic". 2002 FIFA World Cup (tm). Archived from the original on 7 February 2003. Retrieved 13 June 2018. ^ "World Cup 2006 - Match Details". RSSSF. 7 February 2007. ^ "Man of the Match". FIFA. Retrieved 30 June 2016. ^ "올해 가장 멋진 골 '박지성 골'" (in Korean). SBS. 29 December 2002. ^ "일본전 박지성 골, 팬들이 뽑은 '2010년의 골'" (in Korean). KFA. 27 December 2010. ^ "Liverpool stars head nominees". UEFA. 22 August 2005. Archived from the original on 13 May 2008. Retrieved 6 August 2018. ^ "European Footballer of the Year ("Ballon d'Or") 2005". RSSSF. Retrieved 26 April 2011. ^ "uefa.com Team of the Year 2005" (PDF). UEFA. 16 December 2005. ^ "Park's your March star". Manchester United. 30 March 2009. Archived from the original on 2 April 2009. ^ "Park is November's star". Manchester United. 10 December 2010. Archived from the original on 13 December 2010. ^ "Park tops poll". Manchester United. 6 January 2011. Archived from the original on 10 January 2011. ^ "Park and Ji named Players of the Year". KFA. 23 December 2010. Archived from the original on 17 September 2011. Retrieved 23 December 2010. ^ "Japan's Keisuke Honda & South Korea Skipper Park Ji-Sung Head 2011 Asian Cup MVP Shortlist". Goal.com. 28 January 2011. ^ Dyer, Kristian (27 July 2011). "Man. United's Park named MVP of All-Star Game". MLS Soccer. Retrieved 30 July 2011. ^ "[올스타전] '화끈한 골잔치' 올스타전, 6-6 무승부...박지성 MVP" (in Korean). Sportalkorea. 25 July 2014. Park Ji-Sung (7 March 2006). Neverending Challenge (in Korean). Random House Korea. ISBN 89-5986-529-X. Wikimedia Commons has media related to Park Ji-Sung.